The Wounded Star: also known as “The Cubes”. This sculpture represents what we used to call “quarter flats”, tiny flats not bigger than 30m2 which were constructed in the late nineteenth century and have become an icon for the neighborhood. A Room Where It Always Rains: this is a strange one, it’s supposed to have a permanent watering system (hence the name) but it was never made. This is a cage under three great trees, populated by five eye blinded figures with spheres instead of legs. Open to your interpretation. Crescendo Appare: this Fibonacci sequence reaches more 160 meters beneath our feet. It’s impossible to miss considering that the numbers are red neon lights in the ground. Barcelona’s Head: a portrait of Barcelona by Roy Lichtenstein, who said this work was a tribute to Gaudí. 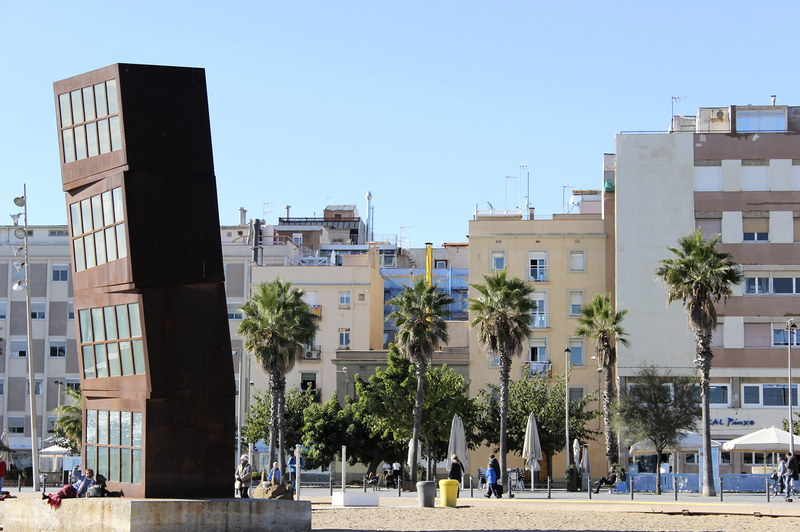 Barcelona’s Head is well known for all barcelonians, maybe because it stands tall on the waterfront and it’s visible from every direction (when I said tall I mean 15 meters!). By the way… Barcelona looks like a woman! Previous Insider’s guide: 2 days city break in Barcelona!